Croatia is located on the crossroads between Southeast and Central Europe, bordering Hungary to the Northeast, Serbia, Bosnia and Herzegovina to the East, Montenegro to the Southeast, Slovenia to the Northwest, while it is separated from its Italian neighbor by the Adriatic Sea. Thanks to its unique geographical position as well as good traffic connections, Croatia’s numerous destinations and wonderful beaches are easy to reach. Croatia has it all in one place: a clean, safe coast, rolling green hills in the countryside, snow-capped mountains and shimmering lakes, as well as pretty rural villages and lively modern towns. Croatia’s exquisite coastline, including the islands, is 5.700 km long which makes it one of the most widespread coastlines in the Mediterranean. With 1.185 islands, islets and rocks it is rightly referred to as the 'country of the thousand islands'. The biggest islands are Krk and Cres. Other well-known islands include Hvar, Brač, Korčula, and Pag. Croatia has medieval architecture, tranquil lakes, and local villages. 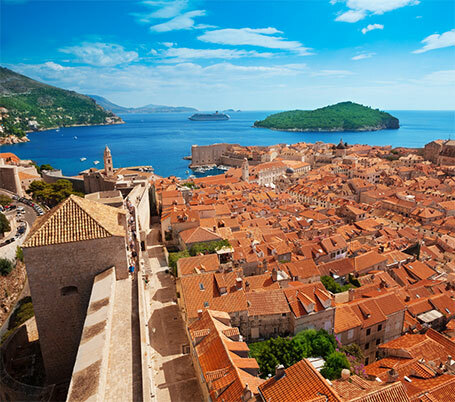 While visiting Croatia, one can enjoy the Croatian charm of Dubrovnik and the pearls of the stunning Dalmatian coast. The majority of people live in towns and cities, but a significant number live in the countryside. Real estate in Croatia is currently in high demand. Zagreb, the capital of Croatia, offers excellent prices, beautiful apartments, both old and new as well as villas. If you are looking for a second home or an investment property with capital gains, a rental income or a combination of both, the Croatian real estate market has much to offer you. Visit us and discover the very best of Croatia. Visit cities with special charm like Dubrovnik; enjoy the purely Mediterranean atmosphere of cities such as Trogir, Zadar, and Split; and explore breathtaking landscapes such as Plitvice National Parks. Croatia - full of beautiful real estate.